The partner companies below understands your needs as a REALTOR®. KAR negotiates favorable rates and pricing from these exclusive insurance partners. Feel free to contact them directly. In addition to KAR’s partners, you can access NAR’s wide range of partner discounts to Realtors®. Click here to find out more about NAR’s REALTOR® Benefits program. Protect yourself from unexpected expenses. KAR is making Aflac’s insurance policies available to you! Aflac pays cash benefits directly to you (unless assigned), when you’re sick or injured. You can use the cash to help cover expenses that major medical does not – like mortgage, groceries, or whatever you need. It’s a safety net for you and your family. Visit Aflac’s webpage for KAR members to get more information. The Kansas Association of REALTORS® is excited to announce a new partner offering exclusive member benefits. 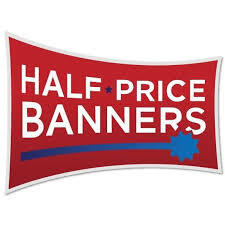 Half Price Banners.com is a Kansas based manufacturing and printing company specializing in a wide array of real estate signage and custom marketing material. They are the largest eCommerce banner company in North America with a well-established reputation for innovation, quality products and exceptional customer service. Live customer support via phone or chat (you immediately reach a live customer service professional, no phone prompts). Please visit halfpricebanners.com to see the selection of marketing materials to help you advance your business. When you order, please enter code KS REALTOR (all caps).